A strong performance after a good start resulted in Roger Day winning the gold fleet from Mike Pritchard and Andrew Beaumont. 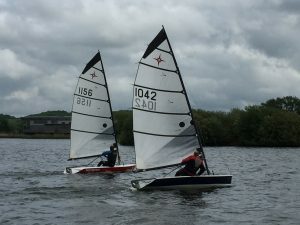 The silver fleet was won by Nick Marlow from Rob Corner and Jon Adams. Brian Dennis won the bronze fleet from Louis Mok and Nick Colbeck. With two races to go the fleets are starting to sort themselves out. Roger’s win moves him in to contention in the gold fleet and only he, Bob Ceurstemont and Mike Pritchard can now win this series. Jill Reid is relegated and Malcolm Davidson and Kevin Last are also in the relegation spots although the three above are also at risk come 3rd July. Nick Marlow leads the silver fleet from Paul Jago with Josie Adams and Rob Corner battling for the final promotion place. Derek Harbour is down and looks like Dave Bexson will follow whilst four are in contention for final place. Roger Chilvers leads the bronze fleet from Louis Mok and Brendan McGrath and seems only Nick Colbeck can hope to break in to top 3 from the rest of the competitors. The fast fleet was won by Roger Day who is hitting race winning form at the moment and it is a shame he is not going to the nationals. Second was Dave Bexson with Keith Brereton third, with Nick Marlow retiring for missing out a mark. Race Officer today, Kevin Milton, leads overall from Roger and Bob Cuerstemont. The slow fleet was won by Mike Pritchard from Andrew Beaumont and Jamie Green. Despite being at a Byte Open Meeting in Carsington today, Paul Jago leads overall from Mike Pritchard and Ray Kemish.